Floor Area 190 sq. mtrs. 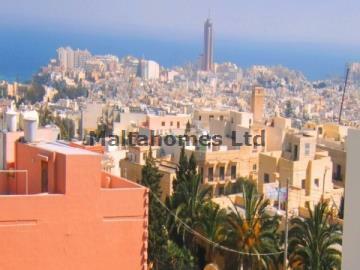 A new development located in a sought after area of Ibragg, compromising of 3 Maisonettes and Duplex Penthouse. The properties boast a bright and airy aspect, being built on a double fronted plot with each unit enjoying private entrance to own door of which two Maisonettes are accessed from one street and the third Maisonette and Duplex Penthouse are accessed from another street. These residences benefit from a private entrance to own door. Penthouse boasts two terraces enjoying truly spectacular sea views, whilst the other terrace has a Jacuzzi installed. This development is brand new and to be sold finished apart from the kitchen. FLOOR AREA: 190 sq. mtrs.